HA! YUM!!!! thats my word for Iron! Chenequa (named after the Wisconsin village where I grew up) is an exceptionally beautiful female whose very first cria, "NeverSummer's Chautauqua", was the high-selling alpaca at the 2011 Futurity auction!! 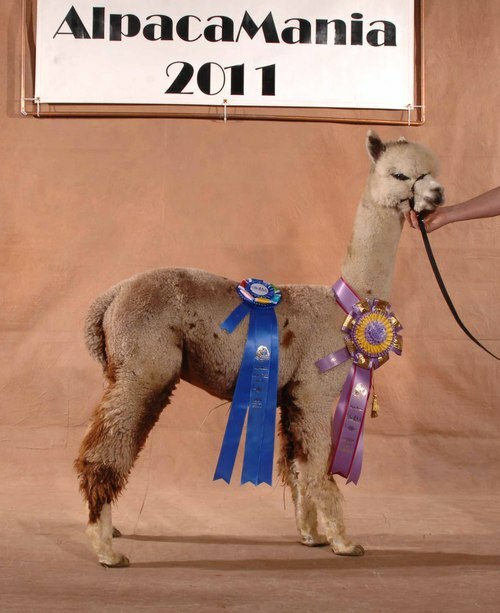 She was also the 2011 Nationals Grey Color Champion and the 2010 Futurity Grey Color Champion in halter and the 2010 AOBA Nationals Fleece Show Color Champion! 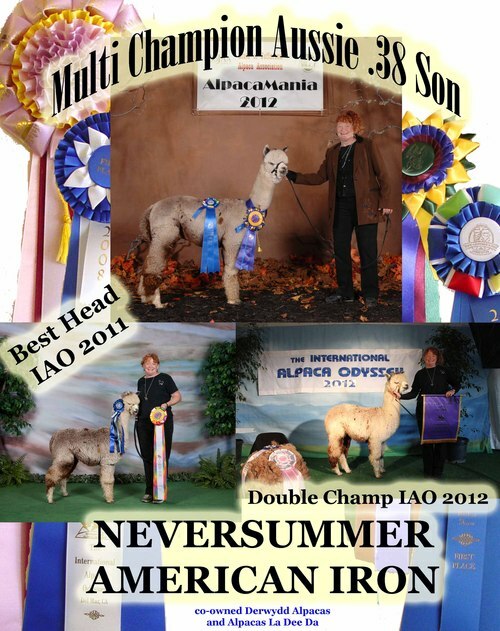 Cria #2, "NeverSummer's American Iron", is another WOW with a very bright future. Chenequa herself is an interesting "medium brown with black points vicuna". 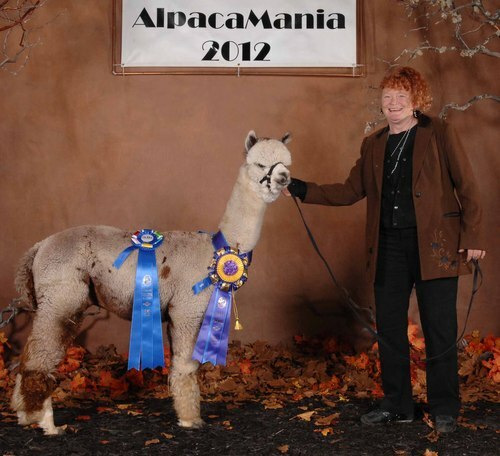 Her dam is a "wanna be" grey - a roaning chestnut brown vicuna with a tuxedo, sired by Lanark's Silver Charm. Chenequa's well known sire is Aladdin of KPR (BB) who also sired our "Supreme Champion", NeverSummer's Black Ice (TB). I especially love Chenequa's super soft handle which she is passing on to her offspring. Of course Chenequa is being bred back to .38 Special! 2015 Histograms just in! AFD 24.7 SD 4.5 CV 18.1 CV 89.7 Curve 36.4 at FIVE YEARS OLD!!! What can I say - when Dee Sousa ran up to me at the bar at the 2011 Futurity and said "wanna go in on Iron!!!" how could I say NO... and so the story began - we had the winning bid and we took this little weanling home with us. His full sister sold that day for over $80,000.... we KNEW we had a winner - we just had to wait while he grew up. 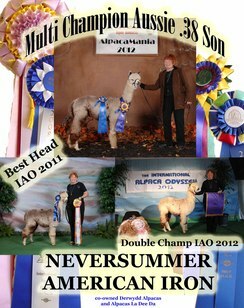 And grow up he did - winning a number of championships along the way including a sweep at IAO 2012 winning the Grey Male COMMERCIAL Halter Championship and Reserve Grey Male COTTAGE Fleece Championship - A fleece good for BOTH divisions!! And THIS YEAR SPINNERS DREAM IAO 2013 - The top award in the Cottage Fleece division! So yeah - he has WON a whole rack of ribbons for us, but really? What I am excited about is his fantastic fineness and the consistency of that fineness thru out his fleece and colored fibers - they are ALL fine... beautiful hand, stocky bone, BEST HEAD IAO 2011!! so yeah - really nice head too.. and all that color... and all those ever so famous ancestors - what a pedigree this boy has - very deep - very proven.. 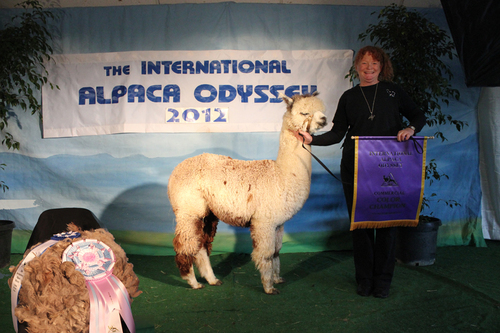 I simply can't wait to get MY first offspring on the ground - he is going to ROCK our colored huacaya breeding program. Check out his pedigree, look over his winnings.. if you had a chance to get look at his fleece while he was on our show string! Well you KNOW its good.